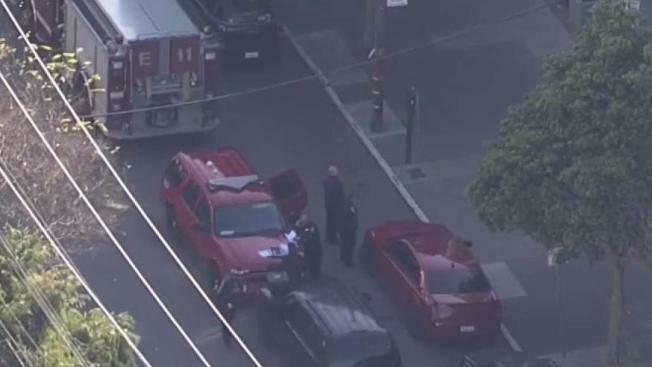 At least 10 students at San Francisco's James Lick Middle School were treated by emergency crews after they ingested an unknown substance, which school district officials now suspect was cannabis. In a statement Wednesday, San Francisco Unified School District officials said that based on the current evidence and symptoms, health professionals suspect the students consumed cannabis. "The students' symptoms were consistent with marijuana intoxication and a container labeled 'medical cannabis was confiscated," SFUSD officials said. Bringing and consuming any drug, whether legal for those 21 and older, such as alcohol, marijuana or, illegal, is against school and district rules, the district said. Teachers will continue to talk to students to prioritize a fact-based drug education program at all grade levels, the district said. School officials said the substance caused "adverse reactions" and that the students' families were contacted. San Francisco Fire Department spokesman Jonathan Baxter said of the 10 students sickened, seven suffered from minor effects, two experienced moderate nausea and vomiting, and one was treated for extreme, but not life-threatening conditions. School officials were first notified of the incident after one student came forward complaining of sickness, with another nine students coming forward. Authorities said five students were transported to a hospital. The other five students are cared for on scene and then taken to a hospital. The district said all the students were recovering at this time.